Earlier I wrote about capturing contacts. This entry is about organizing academic contacts. Software for organizing contacts is not as developed as for other content (e.g. documents, tasks, or bibliographic citations) so finding a good app and a system may take a bit of time. 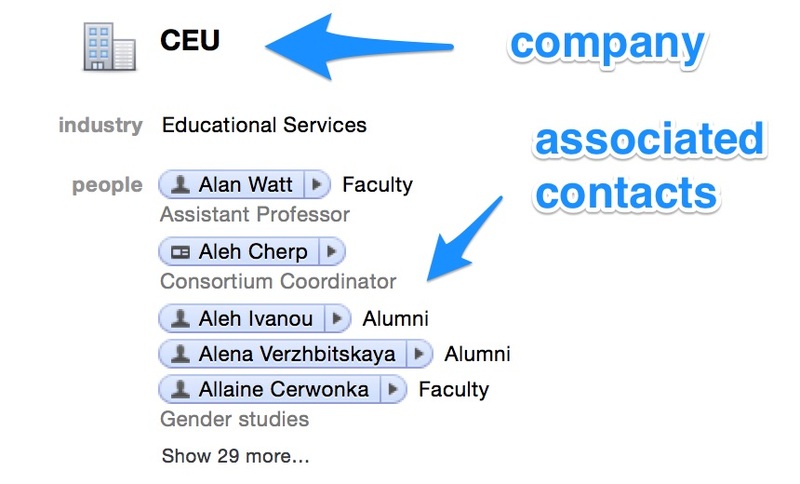 In Apple’s native Contacts app contacts can be organized in Groups such as “Alumni” or “Colleagues”. However, contacts have to be manually dragged to the lists (e.g. you can’t assign a contact to a group from the contact editing window). This is not only slow and clumsy, but also prone to mistakes. Contacts app can also create ‘Smart Groups’ based on search criteria (similar to iTunes’ Smart Playlists). 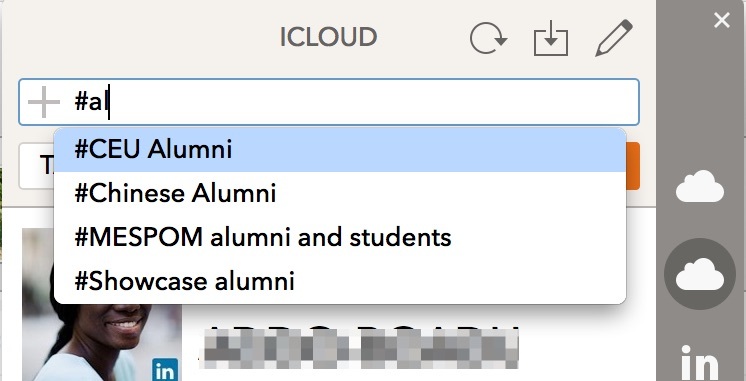 This, in principle, allows faster and smoother organization, for example, one can add text ‘alumnus’ and ‘2014’ into the contact’s note and set smart groups searching for these terms separately or together. This workaround is not very accurate as it depends on remembering exact filter terms. I like that Contacts can ‘link’ contact cards from various servers (e.g. Google, iCloud and Facebook). I am moving towards keeping all my personal and close professional contacts on iCloud (because it lets me easily call and message people from iPhone) and the rest of my professional contacts on Daylite. However, of course there are some people who belong to both categories so it’s handy to see their contact cards linked. What Contacts does not allow is to easily delete a contact from one account while leaving it on another. Pressing the red circle next to an account name does not delete a contact from that account but rather confusingly unlinks the cards. It is of course possible to select a specific account in the Sidebar and delete a contact from there, but it is much slower. I also use Cobook which lets me to enter groups (called ‘tags’) from within the contact card view. To add a tag you just need to type ‘#’ followed by the first few letters of the tag name. This keyboard-based method is much faster and more accurate. However, Cobook does not allow to generate smart lists and is generally better for working with individual contacts rather than with contact groups. Since Cobook’s ‘tags’ match Groups in Contacts these two apps can easily be used together. For professional contact organizing I use Daylite. Though Daylite is multi-purpose software, at its heart it’s a CRM and its main strength is contact management. 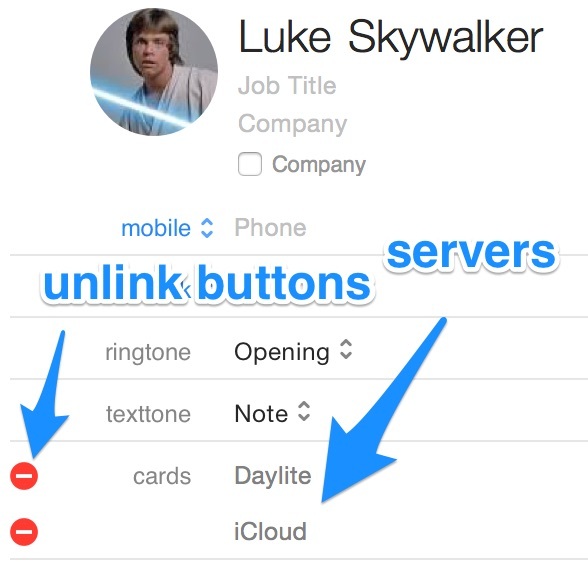 Daylite allows to specify ‘relationships’ between a contact and other entries (e.g. companies, projects, emails, notes, appointments or other contacts) and to assign keywords and categories to contacts. This makes it possible to organize contacts in much more sophisticated ways. For example, a contact may be an alumnus of a particular University, a former PhD student of another contact, a current faculty member of some other University, a past employee of a company, a partner in a project, a co-author of a publication. A user of Daylite can easily edit keywords, categories and types of relationships. As you can see from the above screenshot I adjusted Daylite to work within the academic context. Keywords can also be added to a large number of contacts through bulk editing. Once the relationships have been entered Daylite allows to trace them from other content back to people, e.g. see everyone who works for a particular university, participates in a specific project, or has graduated from a certain program. In addition to this automatic organizing Daylite can create Smart Lists of people (or companies) based on one or several search criteria. For example, I keep a smart list of all people I’ve ever co-authored a paper. It searches for the relationship ‘co-author’ with any of my writing projects. I must admit that my decision to use Daylite was not easy or straightforward. I tried for the first time a couple of years ago, but at that time Daylite contacts were not available to Mac’s Address Book. In essence one needed to manage two different groups of contacts: one in Daylite and one in iCloud. At one point it became possible to link Daylite and iCloud entries, so now all my Daylite contacts are easily manageable (or can be added) from within Contacts or Cobook. This is very important, because Daylite is a heavy-duty app and you don’t want to open it every time you want to look up a name or phone number. The second consideration in deciding to use Daylite was the cost. It is undoubtedly the most expensive app I use (and I have not even bought the upgrade to Daylite 5 yet). Nevertheless I think Daylite is worth it, considering all its potential. Image | This entry was posted in Contacts and tagged Cobook, Daylite. Bookmark the permalink. I am now trying Cobook, which it recommends. Free, and looks quite promising although it’s basically JUST for contacts.